As the stunning new Jones Assembly draws huge crowds and newly-opened Stonecloud Brewery in the Sunshine Cleaners building does brisk business, yet another project is planned for the southern end of Classen Boulevard. 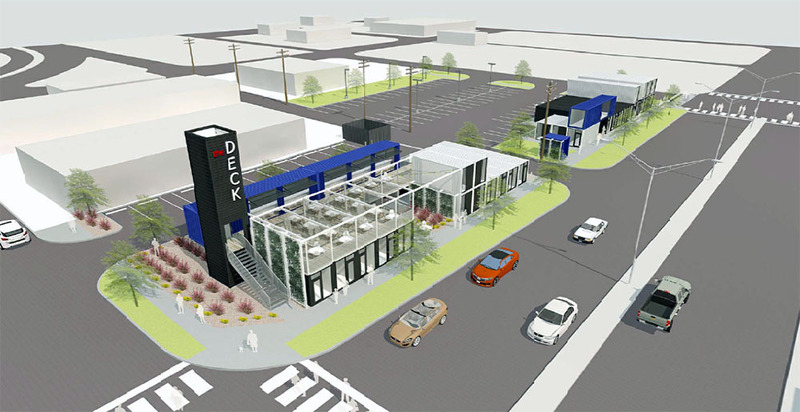 Dubbed The Deck and to be located on the northwest corner of Classen and NW 6th, the project would be built primarily from shipping containers with space for office, retail and restaurant space. The design by Gardner Architects for Northline Development shows two buildings of two levels each with the southern structure featuring an expansive rooftop deck and ground level patio with adjacent space designated for restaurants. 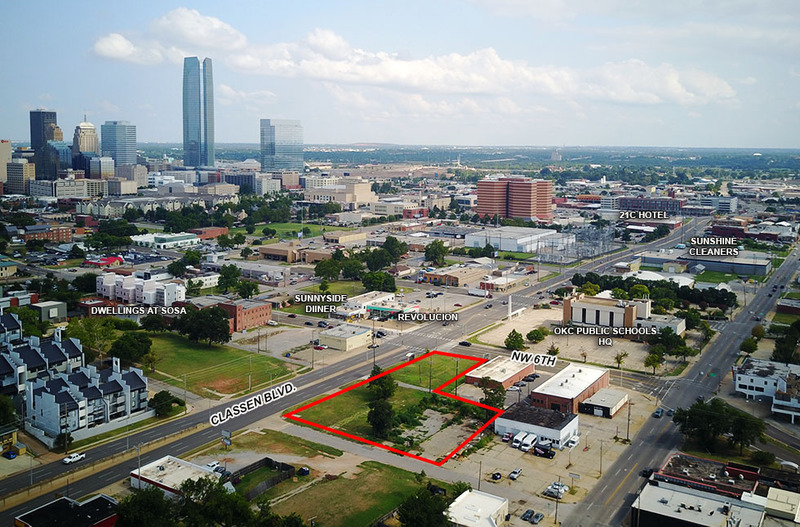 The development is immediately north of what will be the new headquarters for Oklahoma City Public Schools, and adjacent to the renovated auto garage that now hosts the popular Sunnyside Diner and Revolucion. The structures and related parking would take the place of several empty lots. Northline is also developing the Dwellings at SoSA, a 14-unit condo project a few blocks to the east. They are also planning a large food court on another renovated former auto repair shop at NW 10th and Harvey. Actually, using shipping containers is no cheaper than regular construction. They've been used in modernist developments for a long time, maybe 20 years in other states. For whatever reason they never caught on here until recently... I think the Anchor Down structure was one of the first ones I remember seeing here. It makes sense that something like this would go in over by SOSA... fits with that district's modern theme. Yep. Someone I know used containers as part of their building renovation and it was more expensive than a traditional renovation. I'm ready to see OKC move on from this trend. Agreed! Its a different look than brick and the other same materials you see on every other building.....its a nice change-up.....we might be late on this but its a welcome change from the "same-Ole same-Ole"
The reasoning I've heard for them is that they're good for temporary uses since they can just be picked up and hauled off. It could be they're thinking about doing something else with this lot in the future. That's it unless you count individual containers like the shop on 9th Street or the bar at The Yard or the pool house inside the courtyard of Mosaic. The Yard proposed a Phase II with containers but pretty sure that is not going happen and certainly not any time soon. The wind wall at Wheeler and the OK Contemporary offices. But the OK Contemporary thing is temporary. Regardless, this list hardly represents an over saturation and in fact I'd say OKC probably has less than most cities our size. Totally off topic so I'm sorry, but this surprises me. I thought when I read articles about building houses out of shipping containers that it was cheaper. Nope. Talked to several architects about this. From what I understand, by the time you get everything up to code and habitable, the cost savings (if any) are negligible - and in some cases can be more expensive. I guess just personal choices. I'd rather something more traditional myself. Building with shipping containers is quite a bit more than conventional material. We looked into a project that resembled Container Bar in Austin and the architects estimates were staggering. You have to be careful. Architects that aren't practised or familiar with certain construction methods, materials, etc., tend to way overestimate to cover the risk of what they don't know. Contractors do the same if they haven't actually had much or any experience with it. They also add if they think they can for "cool" factor. I would go to parties that have actually done them in other cities and find out what the actual costs were. And, shop around. Make sure you aren't paying for your arch and contractor to learn. He's referencing a project he just had quoted by the only architects working in OKC who have done any of these projects, and they've done several. Locally owned by the Northline group. We are already the parking lot capital of the western hemisphere. We need to focus on holding on to this honor for now. Building a deck, to float or not?